Could Manny Machado be one of the all-time great third basemen? BALTIMORE — Orioles third baseman Manny Machado is 24, yet already some of his teammates think of him as immortal. The question hardly is outlandish — both Machado and Rockies third baseman Nolan Arenado, 25 are so good defensively that they draw comparisons to all-time greats such as Brooks Robinson and Mike Schmidt. With Machado, there is another question, one that is more fascinating, at least short-term. Will he remain at third base? The answer will reverberate not only with the Orioles, who could part with shortstop J.J. Hardy after this season, but also resonate throughout the entire industry. Machado is a free agent after 2018, and a return to short only would enhance his value on the open market, enabling teams to consider him at two spots instead of one. The arguments for Machado staying at third are powerful — he already is a two-time Gold Glove winner at the position, and the wear-and-tear on an infielder’s body is greater at short than it is at third. Still, Machado moved to third upon reaching the majors in 2012 only because the Orioles already had Hardy, a quality shortstop. Some close to Machado say that he still relishes the challenge of playing short, and compares himself more to shortstops than third basemen. On Saturday, in an interview for FS1’s pre-game show, Machado sounded torn when I asked him how badly he wanted to return to his natural position. 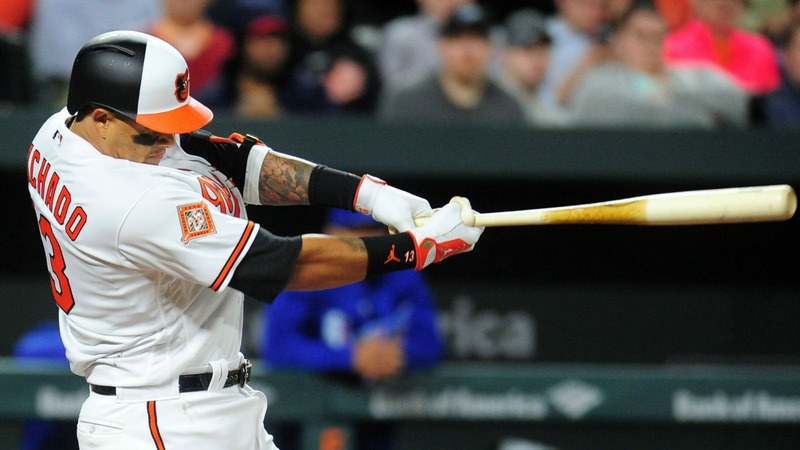 He played 45 games at short last season while Hardy was out with a fractured left foot, and could take over the position full-time if the Orioles decline to exercise Hardy’s $14 million option after this season. “It’s always been there,” Machado said, referring to the thought of playing shortstop. “I’m not going to lie. It’s always been there. “. . . I played a little bit there (last year). That was fun. I trained this year to play there just in case anything happened. I wasn’t ready last year to do it. It kind of took a toll on my body. But I came prepared this year for anything. “It’s there. (But) I’ve made myself who I am playing third base. Everything I’ve done has been third base. I’ve won my Gold Gloves. I’ve done my thing over there, so why change? Machado, while recovered from surgeries to repair torn ligaments in his left knee in 2013 and right knee in ’14, almost certainly would not be as dominant a defender at short as he is at third. He now weighs nearly 220 pounds, Orioles people say, close to the listed weights of bigger shortstops such as the Dodgers’ Corey Seager, Astros’ Carlos Correa and Red Sox’s Xander Bogaerts, none of whom is elite defensively. 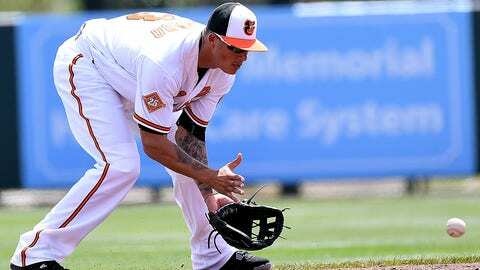 Orioles manager Buck Showalter makes no secret that he wants Hardy back next season, saying with some trepidation, “Once J.J. goes, all the wheels start moving here.” The Orioles, lacking quality prospects at both short and third, would be unable to fill either position from within. 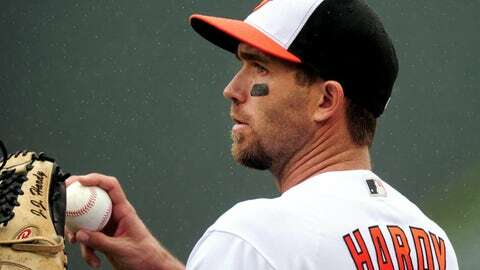 Hardy, though, turns 35 on Aug. 19, and has appeared in only 114 and 115 games respectively the past two seasons due to injuries. After hitting 77 homers in his first three years with the Orioles, he has hit only 26 the past three. So far this season, he is only 2-for-16. The Orioles might exercise Hardy’s option even if he continues to decline, banking on his defense and leadership. That way, they could keep the left side of their infield intact for what likely would be the final year in Baltimore for both Machado’s and Hardy. Another option for the Orioles is to trade Machado and two other stars who are set to hit the open market after ’18, center fielder Adam Jones and closer Zach Britton. The team, however, has yet to enter a full rebuild under owner Peter Angelos, who took over in 1993. Such a retreat would run counter to the competitive natures not just of Angelos, but also of Showalter and general manager Dan Duquette. Machado’s staying at third would not necessarily be ideal for his free-agent value; his agent, Dan Lozano of MVP Sports Group, would find it more difficult to market Machado as a shortstop if the player had only limited major-league experience at the position. Then again, Machado will hit the market at age 26, and potential suitors could entice him by offering him the chance to return to short. Shortstops rarely lose the vision of themselves as shortstops, no matter what disruptions might occur in their careers. Cal Ripken Jr. and Derek Jeter are among those who never wanted to move off the position. Their stubbornness eventually became counter-productive. But that same stubbornness is what made them great in the first place. 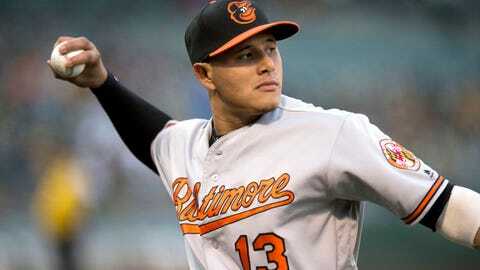 Machado is no different; he almost certainly harbors the same kind of pride. No matter what happens, he probably can anticipate a 10-year contract for at least $300 million. Still, he will become a free agent in the same off-season as Arenado, who only plays third base. What better way for Machado to separate himself than to express a willingness to play either position on the left side? Teams would pay a greater premium to secure his offensive production at shortstop. And Machado, after satisfying his itch at short, could return to third later during his long-term deal and still finish his career as one of the all-time greats at the position. To many with the Orioles, Machado is so good at third that the idea of him playing anywhere else is almost unimaginable. Hardy says that once a week, Machado and Jonathan Schoop complete a double play that no other third-base/second-base combination can turn. Davis marvels that Machado’s throws always reach him at chest-level, no matter where the third baseman fields the ball or what angle he releases it. Would Machado be just as brilliant at short? Or would he be more like Correa, solid but mostly unspectacular? The guess here is that Machado wants to find out. The great ones always do.